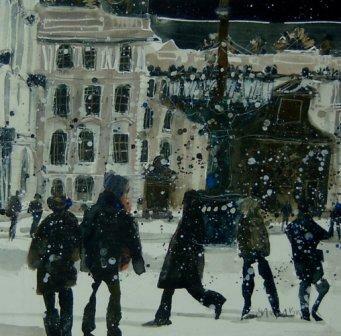 Susan Brown captures the essence of Prague Castle in her stylish watercolour ''Winter Visitors, Prague Castle''. She portrays the old buildings with a lightness of touch characteristic of her contemporary style. The buildings almost have a life of their own not merely a backdrop but an integral part of this atmospheric scene. Her use of a dramatic dark sky and falling snow complements the buildings and adds to the painting. Prague Castle is significant, not only in architectural terms, but as a seat of power. It was to Prague Castle that Alexander Dubcek went as the new Czech leader after the ''Velvet Revolution'' in the ''Prague spring'' of 1968.